You can now take a trip out on a galley.... This replica, called La Liberté, is based in the port of Morges on Lake Geneva. It was the brainchild of the architect Jean-Pierre Hirt and was build as a community project for the local unemployed. Begun in 1996, it took six years to complete. 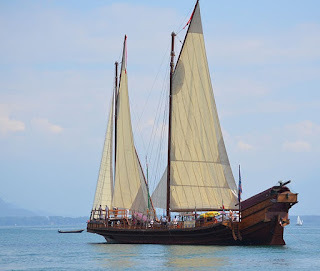 Although galleys did indeed ply the waters of Lake Geneva in medieval times, La Liberté is based on a 17th-century French Mediterranean galley and was built using plans and models lent by the Musée de la Marine in Paris. It's great, but hang on a moment - where are the galley slaves????!! The boat is normally powered by two diesel engines though once a week it uses its sails; apparently it can be rowed; they originally promised us that on special occasions a team of 123 volunteers would take up the 41 oars. Not sure whether this happens though. Virtual trip on the galley - looks a bit cold and grey!